Pressure is one of the most common measurements. Based on their small size, low cost and high reliability, microelectromechanical systems (MEMS) pressure sensors that use the high-volume manufacturing techniques of the semiconductor industry are found in over 90% of today’s applications. It could be said that there are two types of pressure measurements: those that are made using a MEMS pressure sensor and those that will be. In either case, pressure sensors that are easier to use help designers of products for new or existing applications get their products to market faster. Pressure sensors with a digital output and an evaluation board have two aspects that make design-ins easier. 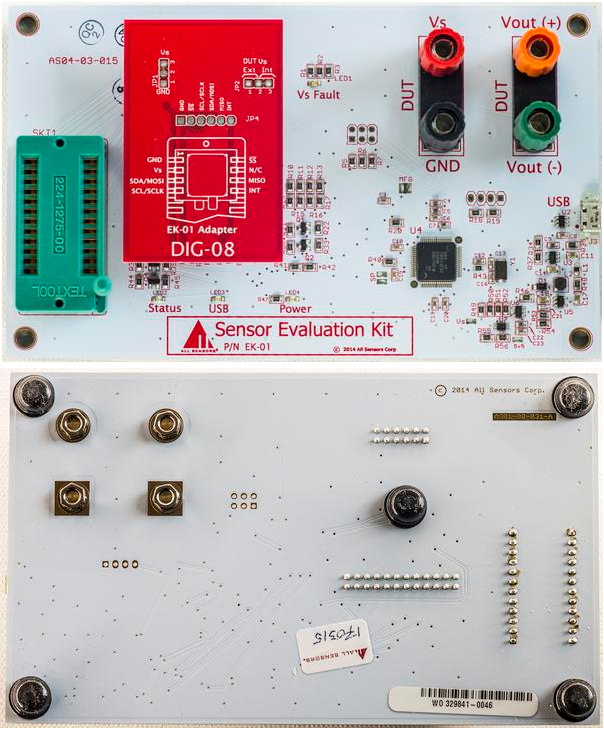 Providing comparative data on two popular MEMS pressure sensors, this two-part white paper will show how pressure sensors with sigma-delta (ΔΣ) analog to digital converters (ADCs) (Part 1) and a sensor evaluation kit (Part 2) simplify design-ins. To simplify the use of an analog sensor in digital systems, some sensor manufacturers offer sensors with an integral ADC. A comparison of test results is shown later in this report. 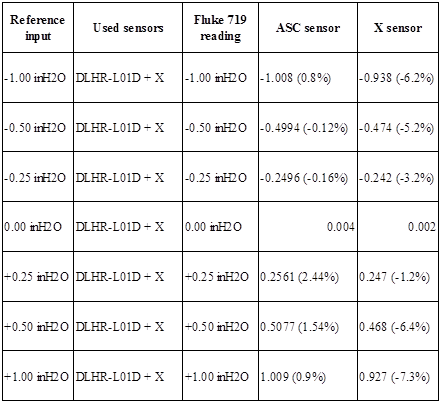 Table 1 shows the sensors from All Sensors Corporation (ASC) and another supplier and Table 2 shows their key specifications. This includes the effective number of bits (ENOB) resolution and the total error band (TEB), which typically provides the most important “accuracy” for many applications. Disregarding the output data resolution, the accuracy (TEB) specifications differ significantly. This confirms earlier theory, that the accuracy of the pressure sensor is a system measurement, not depending on ADC resolution. Since it is not easy to compensate silicon die for good accuracy, linearity and stability, All Sensors chose to use two of the same sensor dies, route pressure to them in opposite directions, and measure the differential signal between the two. Silicon die from the same wafer batch have very good correlation, so errors such as non-linearity, temperature dependence and offsets can be nulled from the output signal. Such an arrangement is similar to making a Wheatstone bridge from two on-die bridge sensors. This patented method \ provides active dual-die compensation for common-mode pressure sensor errors. To provide better performance, especially for low pressure measurements, the die structure in All Sensors’ chip uses a proprietary Collinear Beam2 or COBEAM2™ technology. COBEAM2 technology is designed to provide better pressure sensitivity in a small package, which previously required boss structures and larger die topologies. The smaller die design without the boss structure significantly reduces both unwanted gravity and vibration sensitivity. Has a ZIF socket that allows instant electrical connection, without need of soldering or pin forming. Uses standard Windows USB HID drivers. Eval board using micro-USB connector for data/power. The Evalkit is based around Texas Instruments TM4C1233D5PM Cortex-M4F ARM® microcontroller. It has a native USB 2.0 interface, as well as I2C and SPI interfaces to communicate with sensors and is specified to operate in the industrial range. The evaluation kit comes with a simple to use software tool. 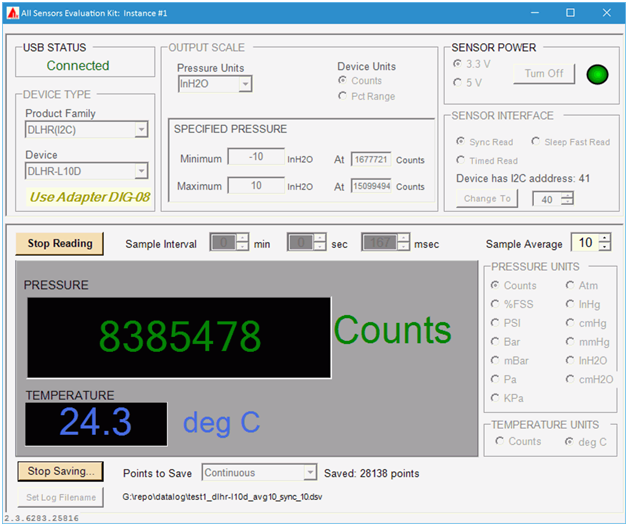 It supports various sensors with both SPI and I2C interface connections, and can be used to set data timings, pressure measurement units and average filtering power. See Figure 3. Once a sensor is properly configured, the software reads both pressure and temperature and displays the results on a graphic user interface (GUI). Data stored into a CSV file can be used for longer data captures and external data analysis. In this testing, a Fluke 719 calibrator provides a known pressure into the sensors and their output digital values are recorded at the same time to compare calibration results. The second port of both sensors is open to atmosphere, converting the differential sensor into a simplified gauge device. Large offset was read from the Supplier X sensor. Additional calibration and compensation math may be required to provide better calibration results, so these results obviously need further investigation. Repeated tests show the same numbers, so the data is provided here as is. Note: the Fluke 719 30G is not the best tool to source pressure levels below 5 inH2O. Similar offset around 7% was detected from the Supplier X sensor as well. Code to interface sensor was reused, with correction for different pressure range. ASC sensor data was below 1.5%. Here, the apparent error of Supplier X’s output was visible and very high, requiring addition correction for 5% offset. This is a good example that higher resolution on its own does not guarantee better accuracy of the system. 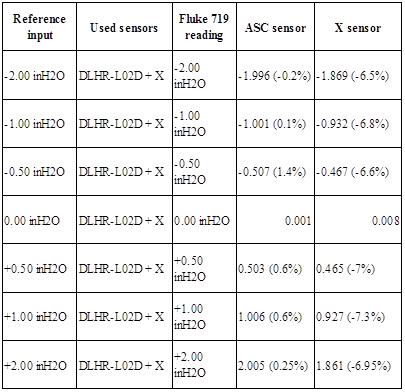 Given the unknown calibration or use history of Fluke 719 used in this test, the obtained results are good, mostly well under 1% for All Sensors DLHR sensors. Thanks to its onboard DSP, which handled all calibration and internal data correction, using the DLHR-LxxD sensors was very easy and straightforward. The other supplier’s pressure sensor however had extra offset, which need to be manually corrected. 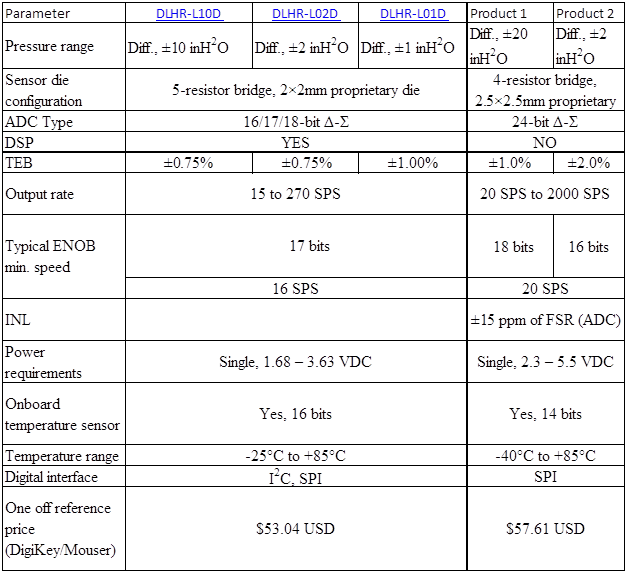 Compensation for Supplier X’s sensors was performed according to datasheet listed math and stored EEPROM data. Years ago, a significant amount of knowledge was needed to implement a pressure measurement into the system, starting from sensor design, low-noise and a stable front end for the sensor, measurement system and compensation methods. 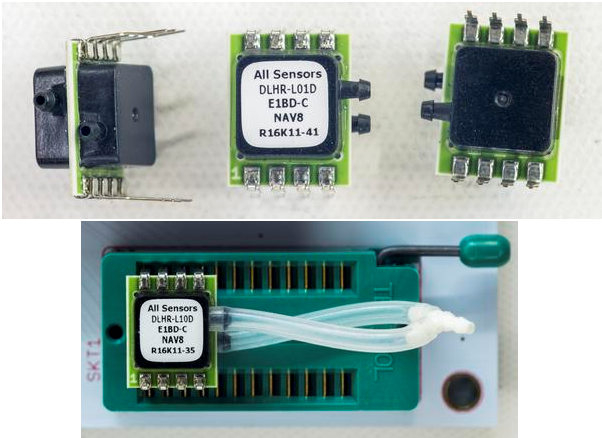 Today, even students without any practical electronics design background can get digital output sensors, connect them to popular platform like a Linux-based Raspberry Pi or Arduino and get initial pressure measurements in a matter of hours, not weeks. The obtained value is already a calibrated and compensated value, ready to be used for further processing in an application. Given the noise levels in the maximum practical application, pressure sensors with an 18-bit ADC provide equally acceptable results as a 24-bit ADC. In fact, 17-bit ENOB is only achievable with a low noise pressure sensor die, such as All Sensors CoBeam2 Technology, which is superior to other low noise solutions. 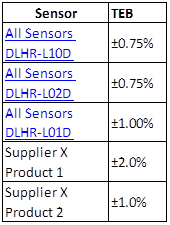 Furthermore, All Sensors DLH/R series pressure sensors are easy to use and require no external math by the user. Signal conditioned silicon pressure sensors with a digital output have achieved pricing and packaging that make them acceptable for a wide number of applications. Their accuracy and digital compensation makes them attractive in variety of precision sensing projects including many industrial applications. These applications include flow metering, liquids level measurements, process monitoring, research, optical power detection and many more. With the new high resolution digital sensors, applications can now be addressed which were not possible before with the industry-standard 14-bit ADCs that provided a maximum 13-bit ENOB. CoBeam2 is a trademark of All Sensors Corporation. All other trademarks are the property of their respective owners.